In the late 1960s Bob Dylan sang about "cruisin’down the highway in a Greyhound bus." Now, the 95-year-old iconic American brand is taking to the British roads. FirstGroup, Britain’s largest bus and train operator, and owner of the Greyhound coach brand in the U.S., said the buses would start running from London, Victoria, to Portsmouth and Southampton on September 14. Tickets will cost as little as a £1, with the average journey costing £7. It plans to roll out more routes next year. The hourly bus service will take just under two hours non-stop and will offer free Wi-Fi, power sockets for each passenger, air conditioning, complimentary newspapers and leather seats. Each bus will be named after women from popular American songs including Peggy Sue, Billy Jean, and Barbara Ann. Sir Moir Lockhead, chief executive of FirstGroup, said: “For 95 years, Greyhound has been an icon of American life carrying millions of people across the USA and Canada. Since First Group took over Greyhound in 2007, we have hoped to bring this famous brand across the Atlantic and I am absolutely delighted to reveal the first authentic Greyhound coaches in the UK.” FirstGroup, which acquired Greyhound’s parent company Laidlaw two years ago in a £1.9bn deal, is hoping to compete with rivals by offering greater comfort and by keeping costs low. 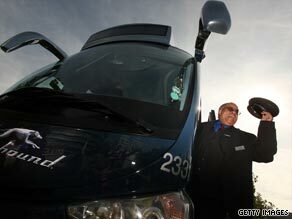 Each coach has 40 seats rather than the usual 50 and most bookings will be over the Internet. Popular with backpackers and those wanting to make long but inexpensive journeys in America, Greyhound was started in Minnesota in 1914 by Swedish-born Carl Wickman. Greyhound buses transport about 25m passengers to more than 2,300 destinations each year.